18 Aug Have a Gourmet Fall! We have all different types of organic lettuce seedlings, frisee, red cabbage, mesclun and gourmet Italian dandelion greens. Grow your own gourmet salads this fall! about the benefits of what we call The Second Season in the edible garden. Planting seeds and plants NOW will provide you with fresh greens and produce well into November. I am constantly trying new veggies. 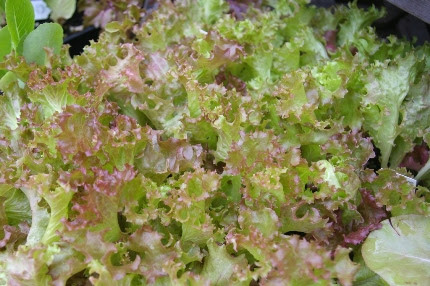 This fall I am growing frisee, a type of very curly green that blends well with the milder types of lettuce my husband loves. Two years ago I planted escarole, and now I won’t be without it. I cook it with my fresh garlic and olive oil or I make up a traditional escarole and white bean soup that sustains me in late October and November when I get home from gardening on those cool, fall days. Broccoli raab and kale both get much sweeter after mild frosts. I am not only planting in the empty space in my raised beds, I am also planting a few more Smart Pots and a couple of large clay pots. The more food, the better! This is a really busy week for us here at Natureworks. On Thursday Jillian is leading a workshop on Making your own Ketchup from 10:30-11:30! 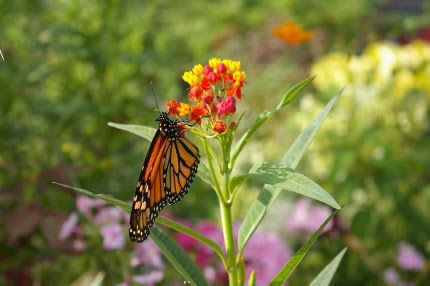 Kassie will be at the Durham Farmer’s Market from 3-6 pm with a focus on Butterflies of New England at her booth. Saturday morning Suzanne will be giving a free talk at 9:30 on Gardening for the Birds. Little did I know we had a bird expert in our midst- I am SO excited to learn from her. AT 11 I will do a demonstration on How to Divide German Iris and then I will hop in my car and drive to the WTIC studio and co-host Garden Talk with Scott Reil from 12 noon till 2 pm. You can call and ask us questions- it’s a live call-in show. All of the details on these events can be found below. Start thinking now about future events that will be happening at Natureworks and mark your calendars. On Thursday, August 25th, Mavi will be offering her second in a series of workshops on Essential Oils. On Saturday, August 27, Diane will be teaching us all about Organic Lawn Care for Fall. This is a REALLY important talk as fall is the very best time to renovate or install an organic lawn. Speaking of the future, I have a back shed filled with organic garlic drying. I will be bringing it in for sale at Natureworks in September. In October, we will be receiving our second shipment of organic seed garlic. Last year we sold out so when we announce the garlic has arrived, get here fast! 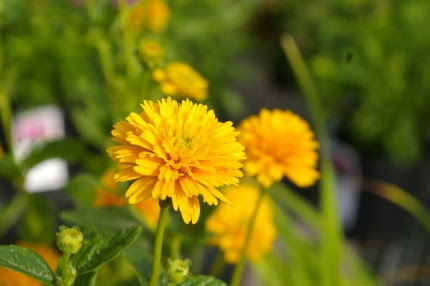 We are also growing a crop of Global Warming mums– the mums that don’t bloom until late October and November and are designed to provide nectar to late season pollinators. 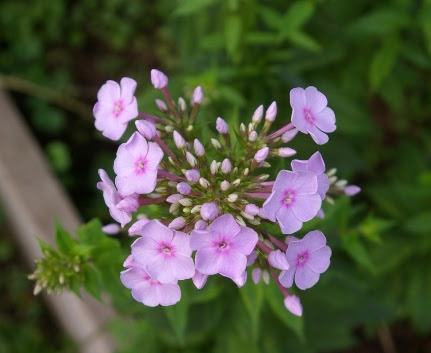 A pre-book form will be available by the end of August as well as a few other special, field dug items such as Phlox paniculata ‘Tracy’s Treasure’ that I propagated from my own stock plants. This is named in honor of Tracy DiSabato-Aust, the author of The Well Tended Perennial Garden. While most of my garden phlox has been blooming for a long time and is beginning to fade, this lovely soft pink variety is juststarting to flower. It’s nice and late and the butterflies love it. And don’t forget BULBS! It’s hard to believe that bulb season is around the corner, but believe me, we are already preparing. I know you must be receiving all kinds of tempting bulb catalogs in the mail or on-line. WAIT! We will have an amazing selection of bulbs at Natureworks and we can teach you which bulbs will work the best for your garden and how to plan your bulb plantings so that you have color from late February thru July. 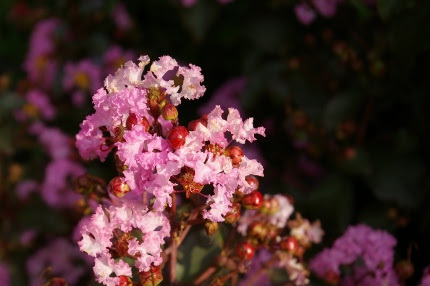 All in stock shrubs will be on sale for the next two weeks. 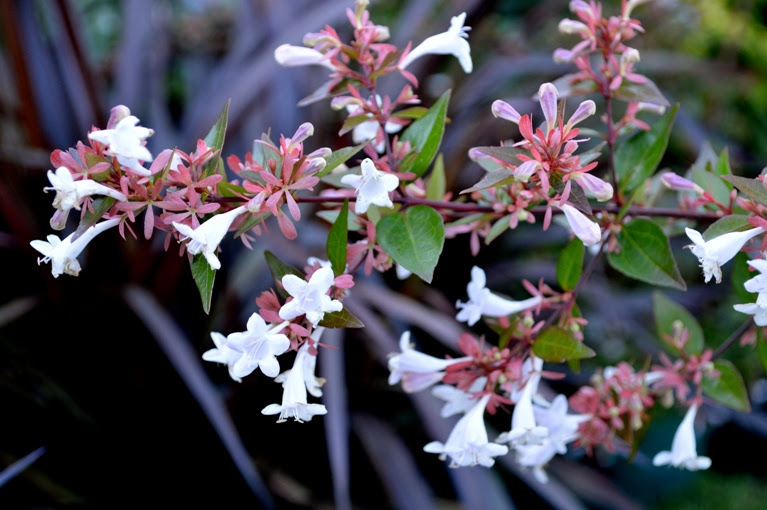 There are so many wonderful shrubs that bloom now including Glossy Abelia, which is beloved by hummingbirds and butterflies. Our Bi-Weekly Sales change this week and the retail staff has come up with quite a generous sale- Diane, our beloved retail store manager is still on vacation and they want to clear the decks before she returns so she can order lots more NEW plants! What does this mean for you? Well, the sale is 30% off ALL ornamental grasses, Sedums, and ALL SHRUBS! Wow! Even if you don’t have the desire to plant right now, take advantage of these savings and do what I do- keep them in a holding area near the hose and keep them watered until you are ready to install them. We have tons of beautiful color to help you tune up your summer-weary gardens and freshen up your tired containers. We continue to restock our benches every single week. A big shipment of fresh annuals has just been displayed on our benches as you first walk into the nursery, ideal for filling in the holes that you may have after the heat wave and drought of the past many weeks. 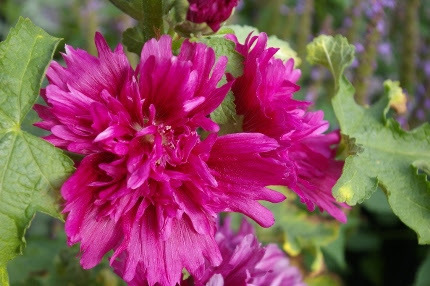 Double purple hollyhocks, long blooming Heliopsis ‘Asahi’, crape myrtles, insanely large perennial hibiscus, sunny yellow Patrinias, drought tolerant Allium ‘Millenium’… those are just a few of the treasures that await you when you stop in for a visit this week.